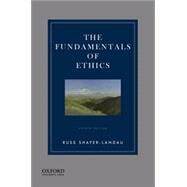 In The Fundamentals of Ethics, Fourth Edition, author Russ Shafer-Landau employs a uniquely engaging writing style to introduce students to the essential ideas of moral philosophy. Offering more comprehensive coverage of the good life, normative ethics, and metaethics than any other text of its kind, this book also addresses issues that are often omitted from other texts, such as the doctrine of doing and allowing, the doctrine of double effect, ethical particularism, the desire-satisfaction theory of well-being, moral error theory, and Ross's theory of prima facie duties. Shafer-Landau carefully reconstructs and analyzes dozens of arguments in depth, at a level that is understandable to students with no prior philosophical background. Ideal for courses in introductory ethics and contemporary moral problems, this book can be used as a stand-alone text or with the author's companion reader, The Ethical Life: Fundamental Readings in Ethics and Moral Problems, Fourth Edition. Russ Shafer-Landau is Professor of Philosophy and Director of The Parr Center for Ethics at the University of North Carolina at Chapel Hill. He is the author, editor, or coeditor of several books including The Ethical Life, Fourth Edition (OUP, 2017). He is also the editor of Oxford Studies in Metaethics. 2. Is Happiness All That Matters? Does It Matter Whether Psychological Egoism Is True? Does Virtue Ethics Offer Adequate Moral Guidance? Is Virtue Ethics Too Demanding? Who Are the Moral Role Models? How Is It Possible to Argue Logically about Morality?